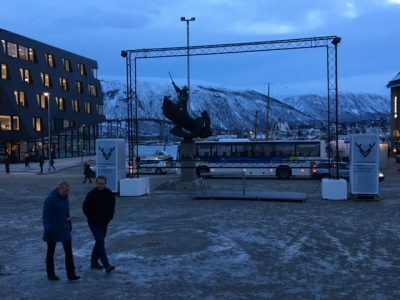 TROMSØ: Strong Arctic winds in Tromsø spoiled plans for an outdoor cinema at its annual Tromsø International Film Festival (TIFF) that started rolling this week. Otherwise the popular film festival was attracting large crowds as usual and packing local hotels and restaurants. It’s the 28th time the film festival is being held in Norway’s Arctic capital of Tromsø, which runs from January 15 to 21 this year. TIFF, which has a high-profile presence all over town, is not only popular with local residents but is also billed as an important meeting place for the Norwegian and international film industry. Cold and hurricane-force winds that slammed into Norway’s northernmost counties of Troms and Finnmark this week, however, have at best delayed outdoor showings of films on the program. TIFF officials reported Monday that the winds had destroyed the outdoor screen set up in town, delaying its official opening and cancelling all the showings planned for Tuesday. “We at TIFF are very sorry that this has happened, and apologize for the inconvenience caused for the public,” TIFF officials stated on their website Tuesday. “We expect the winds will die down so that we can set up a new screen.” It was still blowing a gale Tuesday afternoon, but officials were optimistic and planning alternative showings of films for children at some local day care centers later in the week. The film festival itself kicked off Monday morning. It’s Norway’s largest film festival in terms of visitors, growing from an audience of 5,200 in 1991 to more than 61,000 last year. It’s also the largest annual cultural event in Northern Norway and included the debut of a new documentary on the philosophical doctor Per Fugelli, who died last year after having publicly shared his experience of the dying process and attempting to demystify it. The film received good reviews. Also on the bill, along with dozens of Norwegian and international films, is Den 12. mann (The 12th Man), a remake of an earlier film about the dramatic experiences of a Norwegian resistance fighter during World War II. Jan Baalsrud was the only survivor among 12 resistance fighters who were attacked by occupying Nazi German forces while sailing into Northern Norway to carry out sabotage plans. He escaped despite serious injuries by trudging over the frozen landscapes of Nord-Troms, even swimming over ice-cold fjords, and receiving help from local residents and Sámi reindeer herders to get over the border to safety in neutral Sweden. The film, which is already being shown in Norwegian cinemas, was filmed on location in the Lyngen area east of Tromsø and is full of spectactular Arctic scenery. Tromsø newspaper Nordlys reported this week, however, that Lyngen Mayor Dan Håvard Johnsen is now being criticized for exceeding an approved budget for the film subsidy that served as an incentive to attract the film crew. Johnsen was unapologetic, saying that roughly an extra NOK 90,000 (USD 11,000) was spent “to be a good host,” spread more publicity about Lyngen and expose the scenic area as a film location. Aage Aaberge of producer Nordisk Film called the criticism “sad,” stressing that the money spent by the film crew in Lyngen far exceeded the public funding.